Promising innovations, a comprehensive industry overview and an attractive international conference program—that is what you are guaranteed to find at the 25th analytica in Munich. The International Trade Fair for Laboratory Technology, Analysis and Biotechnology is opening its gates one month later than usual. From May 10–13 more than 1,100 exhibitors will present the latest products and developments for laboratory operations. As in the past, topics such as food and plastics analysis, genetic analysis and bioanalysis will play an important role. However, this year's first-rate events will also focus on the latest technologies for “Laboratory 4.0”. Visitors who attend analytica 2016 can find out how increasing digitalization in all branches of industry will change routine laboratory applications in the future. The industry's leading trade fair in Munich allows manufacturers to present the latest technologies and future-oriented IT solutions for the smart laboratory of the future. Once again, trade-fair participants can be on hand when experts in two laboratories present their latest developments and laboratory equipment live! This year, the extremely popular Live Labs revolve around the topics of food analysis and material analysis. Exciting live presentations and experimental lectures will be held several times each day. During the breaks, anyone who is interested will have plenty of time to gather additional information about the latest equipment developments. The special show on Occupational Safety/Health and Safety in the Workplace is certain to be another highlight in the program of events at analytica 2016. When it was first held two years ago, it was a popular attraction from the very beginning that drew more than 4,000 visitors. Safety experts will conduct impressive experiments that demonstrate where dangers lie in everyday laboratory practice and how to protect oneself against them effectively. The 30-minute experimental lectures on each day of the fair promise to be highly explosive—naturally, without putting visitors in any danger. As in the past, this year's analytica conference will feature scientific highlights and some of the industry's most distinguished international experts. Renowned researchers from around the world will discuss the latest analysis trends in chemistry and the life sciences. There will be lectures on topics such as environmental, water and material analysis, bioanalysis, laboratory medicine, diagnostics, biotechnology and genetic therapy, and the conference will also deal with issues such as food safety and quality control. There will also be presentations of current and future research activities in the chip-technology sector. Planned sessions include topics such as “Emerging contaminants—Novel analytical concepts,” “Metabolomics—new technologies” and “Lab-on-chip technology.” In addition, several “stars” in the analysis industry are expected to speak in Munich: Last year, Professor Luigi Mondello (Italy), Professor Peter Schoenmakers (Netherlands) and Dr. Dwight Stoll (USA) were ranked among the 100 most important analysts in the world by “The Analytical Scientist” magazine. Conference participants can look forward to several “big shots” in the field of analytical chemistry to appear in a session titled “New strategies in modern analytical spectroscopy—Surprising insights.” They include Professor Gary M. Hieftje from Indiana University (USA) and Professor Jörg Feldmann from the University of Aberdeen (Scotland). Professor Alejandro Cifuentes (Spain), a figurehead and the man who coined the term “foodomics,” will speak at the session on “Foodomics—Tools for Comprehensive Food Analysis.” The conference is being organized by Forum Analytik, an alliance of Germany's three leading scientific associations, i.e. the German Chemical Society (GDCh), the Society for Biochemistry and Molecular Biology (GBM) and the German Society for Clinical Chemistry and Laboratory Medicine (DGKL). Admission to the conference is included in the ticket to the fair. 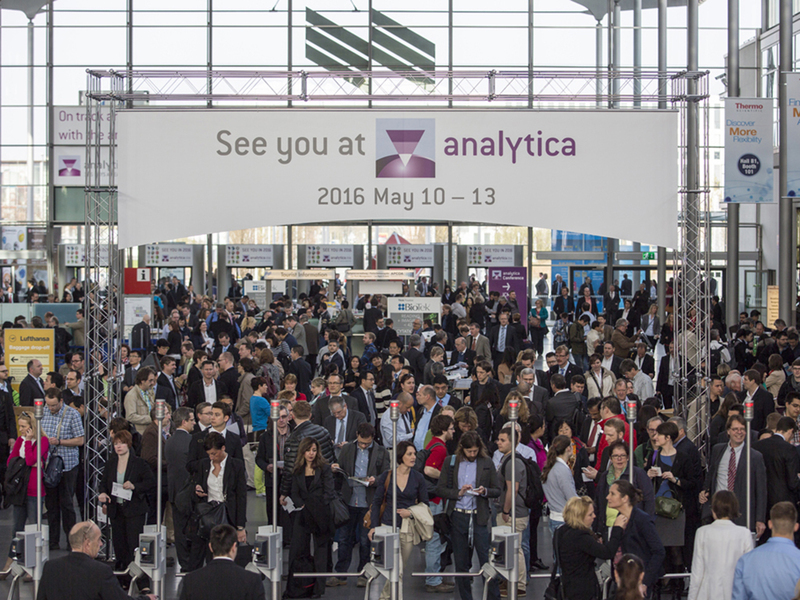 Besides the international exhibition and the conference, analytica's attractive supporting program is the fair's third pillar. The Biotech Forum in Hall A3 and the Laboratory & Analytics Forum in Hall B2 will enthrall visitors with Best Practice lectures, inspire them with reports based on actual experience and give them useful tips for routine laboratory tasks. On Friday, the last day of the fair, jobvector career day takes place in the Laboratory & Analytics Forum. It will give entry-level applicants as well as seasoned professionals valuable tips for planning their careers. They can also have HR specialists analyze and optimize their application documents at the application-portfolio check. Another highlight: live job interviews in which the applicant answers questions posed by personnel professionals. Student Day, which prepares future professionals for careers in the analysis, laboratory technology or biotechnology sectors, also takes place on Friday. Professionals will inform them about the prerequisites for pursuing degrees and subsequent fields of employment. Finance Day in Hall A3 on the third day of the fair gives biotech startups help getting started. New companies in the life sciences can get tips on how to win over investors for their companies. This year's lectures will focus on alternatives that are available on the American market. And on May 13, 2016, everything at the “Personalized Medicine” theme day will revolve around personalized therapy thanks to modern diagnostics and genetic therapy. Anyone who wants to know which training courses are recommended for the laboratory sector can gather information from the training and consulting firm Klinkner & Partner. Once again, its experts will be offering special courses for laboratory specialists selected especially for analytica. Visitors can expand their technical expertise just a few steps away from the exhibition halls. The free analytica app allows visitors to optimize preparations for their visit to the fair and gives them access to the latest information at all times. The app will be available at www.analytica.de/app prior to the fair. The analytica show preview can be used for editorial purposes free of charge; the source “analytica / Messe München” has to be named. Pictures can be requested at presse@analytica.de Voucher copy requested.